"Fieldstone church built in 1874"
St. Paul's Normanby is only 2.75km from the village of Neustadt and is attended by many village residents. An attractive site with the church yard adorned with lilacs and stately maples. Being on the route to the "Diefenbaker School", it comprises part of an enjoyable and highly recommended side trip for visitors!!! 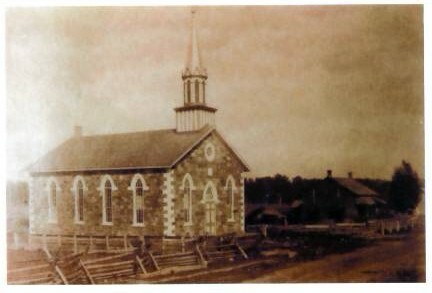 The first Lutheran church service in the immediate area in Normanby Township was held in 1859 when a congregation was organized with 37 members. A building lot was procured and a log church built. The cornerstone of the present handsome fieldstone structure was laid in 1874. One of the few changes to the site over the passing years has been the construction of the present brick parsonage in 1917 to replace a wooden structure. The bell measuring 42 inches at the mouth and weighing 1,350 pounds, was brought by train from Cincinnati, Ohio in 1925. A memorial cairn dedicated in 1937 stands on the church grounds. There is no finer example of a country church, and no more pleasing for Christian worship. The 130 year old fieldstone structure and cemetery, with its pastoral setting on the crest of a hill encircled by tidy dairy farms, presents an enduring image of rural well-being. Information taken from the book "Neustadt: The Story of an Ontario Village"
Information pertaining to St. Paul's Normanby (Birth, Marriage, and Death records for St. Pauls Lutheran Church) is available on microfilm at the Ontario Archives in Toronto. They may be available in other locations as well, please check your local library.